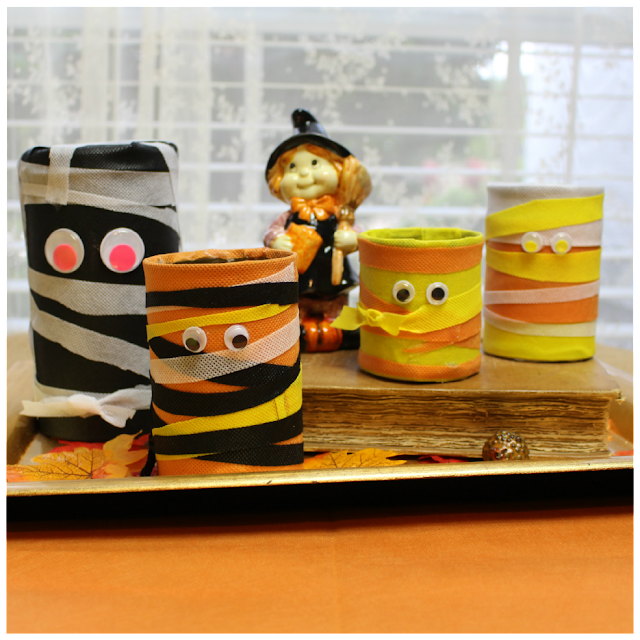 It is all about cute Halloween crafts this week and today we have Vanessa from DIY 180 sharing with us! This year is by far my favorite time of year. 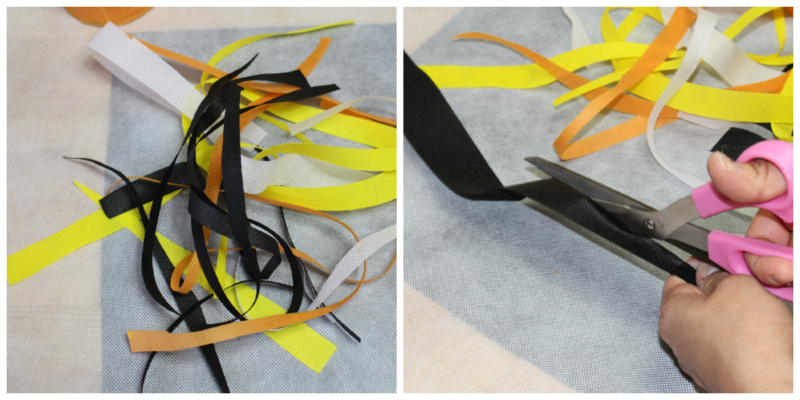 I love to work with different material to create some cool and inexpensive Halloween decor. Today I am sharing with you a great and fun project you and your kiddos can create together. Great thing about Oly Fun fabric is it doesn’t fray and easy to use. A word of caution though, this fabric does not tolerate heat well. You can’t iron this fabric and when using your hot glue gun don’t let the nozzle touch the fabric. 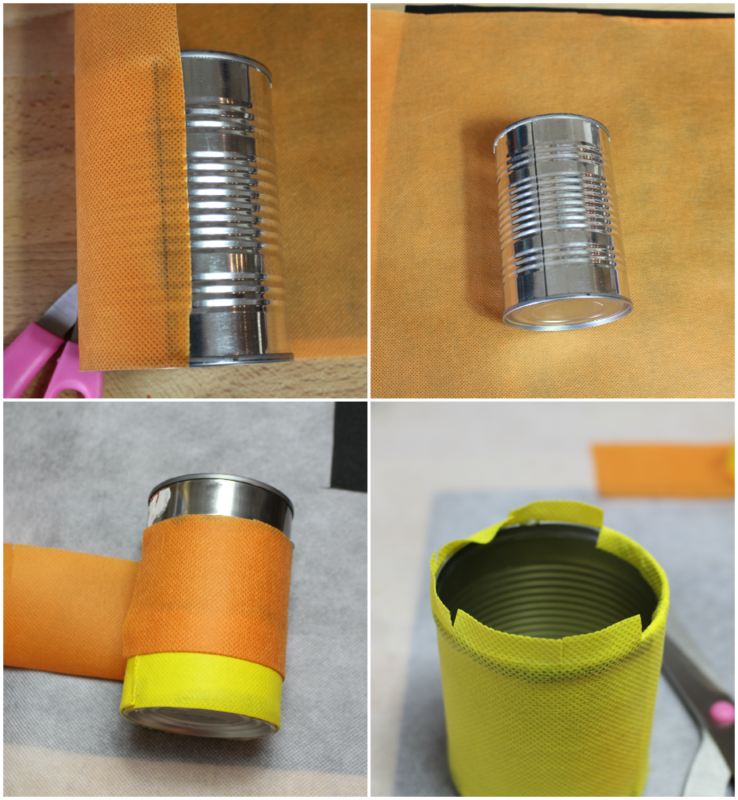 First thing to do is measure out your fabric and glue your fabric to the tin can. You can glue down different layers of color fabrics. When you are done, cut slits on the top of the can and add hot glue, press down to give the inside of the can a clean look. 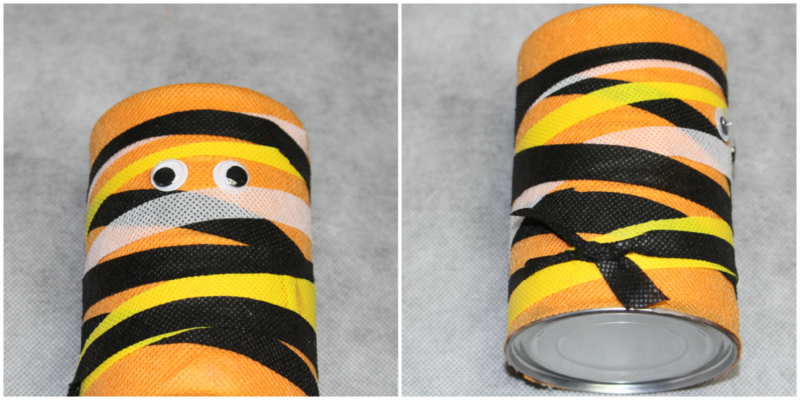 I took the scraps fabrics and cut strips to embellish the cans. At this point you can add wiggly eyes, buttons or gemstones. Get creative and use what you have in your craft supplies. Here is the finish product. Didn’t I tell you this would be a fun and easy project. These fabulous Halloween tin cans décor would be great filled with candy or used for a Halloween party! Thanks Vanessa! Super cute and so fun for kids! Also, thanks for the tips on using the Oly Material. Be sure to come by all week for more Halloween inspired tutorials using Oly Material. There will be a chance to win your own later this week! So be here! Right here at The CSI Project! These are just way too cute.I am going to make them and enjoy them.Thank you. Haha, these are awesome. Kids would love these. These would also make great musical shakers by adding a lid of sorts and some corn to make noise. Very cute, I would use them to stuff with candy in a centerpiece. Gonna make this with the kiddos! These are fun, I love upcycled projects. Thanks for sharing.